4wd Camper Hire in Darwin - Do I need it? Logic dictates that if you are travelling into or across Western Australia or the Northern Territory you will require a 4wd, or at the very least you are going to WANT a 4wd camper in these areas. Why? Because it is SOOOO much more fun. Seated on the Timor Sea, between the Tropic of Capricorn and the Equator; Darwin is the gateway to beautiful dark-colored lands, green, blue and red. This central northern state grants you access to the most iconic section of Australia – the “never-never”, Kakadu, Uluru and more. Be it visiting Kakadu national park, or Litchfield and other world heritage parks, this journey will not be complete without the assistance of a 4wd campervan, at least not if you wish to venture into the more rugged lands of this sparsely populated territory that has proven itself quite popular among visitors from South East Asia. Otherwise you might find yourself restricted to the tamer attractions of the city and the overcrowded parts of the great parks. 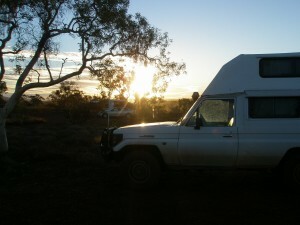 Why do you need 4wd camper hire in Darwin? This territory of Australia is home to a diversity of destinations, including dirt and sand tracks,beaches, rocky roads, river crossings and goat tracks, some scattered randomly in the wild, others situated on private property. 4wd campervan hire is a necessity to optimally take these sites in, and take advantage of all that might be on offer. A considerable portion of the northern territory, up to 52% in fact is nothing more than dirt roads, that being more than ten thousand kilometers of dirt road, this taking into account the private properties permitting tourists to traverse through; this much dirt makes 4wd campervan hire in Darwin an essential. This isn’t taking into account the more popular attractions such as The Olgas, many of which eventually become irritating traps for two wheel drive vehicles when heavy down pours meet extensive dirt tracks; indeed it is possible to restrict oneself to the properly paved tracks, though that requires foregoing the adventure offered within the many national parks that Darwin has to offer. Truly appreciating how beautiful this country is means truly immersing oneself in the rugged lands of the Northern Territory which starts with adventuring off the beaten path and voyaging into more difficult lands to traverse, lands that have been nothing but trouble to those in 2wd campervans. -It is worth taking into account, that only 48% of roads are paved in the territory. Where Should I Go in a 4wd Campervan? Stretches all the way from Cairns to Broome, from the Queensland coast to the western coast, providing a multiplicity of tracks and paths to adventure along. 4wd campervan hire from Darwin allows you to get to the middle point rapidly and then choose whether to go west or east from there. While trepidations are most definitely natural with the prospect of venturing into such wild lands, it is worth pointing out that when its dry these tracks are frequented by a great many tourists, many of which should be willing to offer much-needed assistance, though not too many to create unnecessary crowds. Stretching all the way from the South Australian border to Mount Dare and its surrounding territory, Binns track provides a pretty interesting view of an ever-changing landscape, making available to you a multitude of adventurous paths to some of the lesser known national parks, this track is advantageously marked with signposts so as to aid those that might lose their way. Binns track provides the option of enjoying the surrounding dark landscape or joining the savannah way and drinking in its many wonders, the Binns track is perfectly placed to guide you to Adelaide and Melbourne beyond that. 4wd campervan hire has more to offer to both the rookie tourist and experienced traveler than might meet the eye, designed to ensure the maximization of adventure by taking full advantage of all that the Northern territory has to offer, straying from the common tracks to enjoy the dark rugged lands, surrounding mountains and hills, and taking optimum advantage of this much hyped trip. There would be no point in straying so far from home, seeking out the mysteries of Darwin only to cave at the thought of wandering out into the muddy tracks of the national parks and surrounding forests. Going to the N.T. – get a 4wd! and the best place to get the most competitive prices from the best companies is right here. This entry was posted in 4wd camper hire darwin, Travel Features and tagged 4 wheel drive, 4wd, 4x4, camper, campervan, Darwin, hire, Northern Territory, rent, rental. Bookmark the permalink.